It's more thorough of a wash job than that. 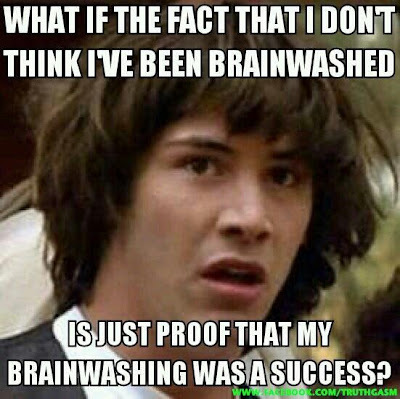 They don't just believe they are not brainwashed, the question has never occurred to them and as long as they keep reading TIME and watching MTV, it's *impossible* for the question to occur to them. Oh brave new world, that has such people in it. EDIT: And one more thing-- don't ever stop considering what questions it is currently impossible to occur to you. This is what I've been thinking about a lot lately and I'm worried just how large and numerous my own blindspots are. The only solution is to be as intellectually curious as possible. To learn voraciously. To read things that challenge us. To read things that are hard for us to understand and then try to understand them. To expose ourselves to ideas far removed from our present culture and place on the timeline. Read old books. Read foreign books. Turn off the TV. You have already absorbed its biases and blindspots. You'll never learn anything new from it. Want something extra challenging? Extra credit to anyone who spends the next week deeply digging through the essays on this blog. It's pretty disturbing.